The peace process slowly moves forward, while younger activists opt for Facebook over guns. For years, Thailand has been engaged in a little-known war in its Malay-speaking southern provinces (or “Patani,” as the locals call it), the origins of which lie in the country’s sustained policy of assimilation that started with the annexation of the region by Siam in 1909. Both sides in this conflict are dug in. While statistics have not been kept throughout this century-long conflict, since 2004 – when data started being systematically collected – more than 10,000 people have been injured and nearly 6,000 killed. It has only been this year with the commencement of formal bilateral peace talks in February that the resistance movement has been able to learn just how far the Thai government is willing to go to secure peace along its southernmost borders. There are positive signs that Bangkok is willing to discuss the full scope of the prickly issues that epitomize the resistance movement’s complaints and demands. However, one of the challenges that beset these talks is the degree to which the parties at the table are able to look beyond their own set of concerns and represent the voices and perspectives of civil society in Patani. What has begun to emerge amidst the peace talks is a resistance movement that is gradually shifting from a purely militant-led strategy to political action led by civil society. Activists I have spoken to in Southern Thailand, who are as fluent in Thai as they are in their native Malay, like to point out that they have over 5,000 friends on Facebook and, “will not remain silent on the issues.” Contrary to the widely held assumptions about resistance indoctrination in Patani, this civilian-led movement is not emerging from unregulated Islamic boarding schools – long accused of being the breeding ground for radicalization – but from Thailand’s own public education system. The current bilateral dialogue process is the first time that the government has formally acknowledged the armed resistance movement led by the highly secretive National Resistance Front, or BRN. Another first for these talks is the formal participation of the Malaysian government, in this case as a facilitator, which is seen by seasoned Patani-watchers as a crucial development given the historical tendency of resistance groups to use peninsular Malaysia as a safe haven from which to mount attacks and more recently seek refuge. 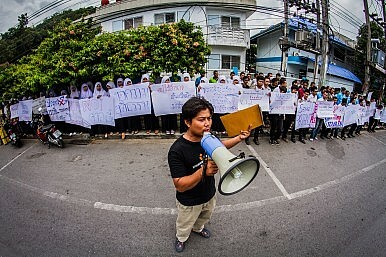 In April, BRN for the first time publicized its preliminary demands, which included an expanded role for the Malay facilitator, the inclusion of external observers, release of political prisoners, and – perhaps most vexing of all for Bangkok – the complex question of Patani-Malay indigenous rights. Barely nine months in, this tentative peace process has already succumbed to hubris, best illustrated by an abortive ceasefire episode that collapsed within days of its announcement. Young people inclined to political action have started to quietly question the logic of an overwhelmingly militant struggle in Southern Thailand. Pointing out the intrinsic limitations of this approach, one former member of BRN’s political wing, Aziz, recalls the early days of the conflict in 2004; “In areas where the population provided strong support, BRN carried out too many political activities and military operations…The battle intensity exhausted communities and put them at risk of retaliation from the Thai military.” Thus, instead of protecting the population, BRN shot itself in the foot by actually inviting insecurity in those areas it controlled. Aziz, a university graduate from Ramkamhaeng University in Bangkok, claims that he complained internally at the time and urged BRN to adopt a more politically savvy approach. He explained that only when BRN found itself on the ropes during the last ten years did it reluctantly lift its injunction on members operating – or hiding in plain sight as it were – within local government, security services, or joining political parties . Can a Malaysia-facilitated initiative finally bring an end to conflict in Southern Thailand? Will Southern Thailand Turn to Jihad?The Southern Link in Thailand's Deadly BombingsBangkok Turmoil and Thailand’s Deep SouthWho Will Be Thailand’s Next Prime Minister?Will Thailand’s Chinese High-Speed Railway Be Worth It?